Flaxseed comes in many forms – whole, ground and oil. Whole flax can be stored longest and ground with a spice or coffee grinder as needed. If you're interested in becoming a corporate sponsor, contact Jodi Street, Director of Corporate and Foundation Relations, j.street@aicr.org. Sponsors of the Health-e-Recipe program play no role in AICR recipe development; all AICR Health-e-Recipes are developed according to AICR guidelines and tested by AICR staff experts. 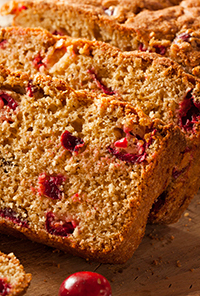 Two of the season’s most-loved foods come together in this delicious homemade bread. Pumpkin's potent beta-carotene and cranberries' anthocyanin phytochemicals are blended together with flaxseed's protective omega-3 fats. Flax is also being studied for their lignans, plant estrogens which may play a role in protecting against breast cancer.